Did a seventh-grader just prove the NFL wrong over Deflategate? Twelve-year-old Ben Goodell did a science project aimed at debunking the Deflategate controversy. First, he tested the football in a humid environment. Then, he subjected the ball to cold. Seventh-grader Ben Goodell — to be clear, he’s not related to NFL Commissioner Roger Goodell — even placed it in the snow and in the wind. The results were clear, he says: The football’s pressure dropped by 2 pounds per square inch each time, findings at odds with those of the NFL in the ongoing Deflategate saga. 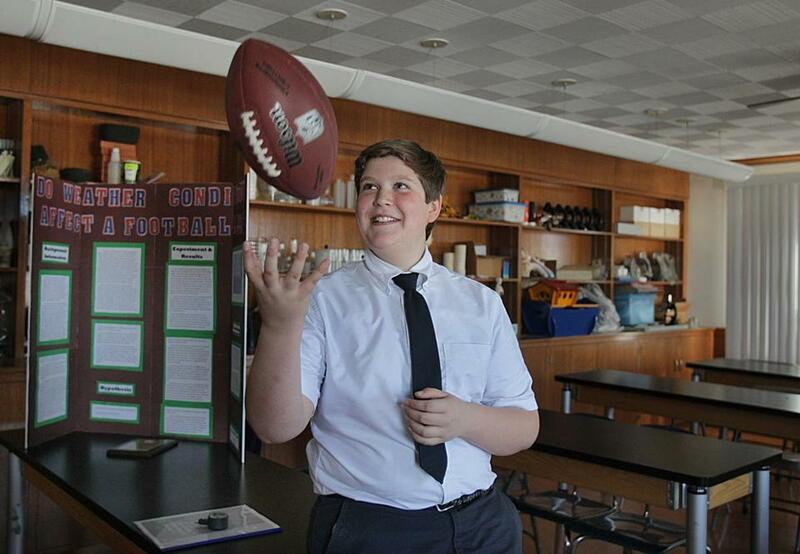 Goodell, a 12-year-old student at the St. Pius V School in Lynn, tested the football as part of a science fair project last month. His award-winning experiment, coupled with his last name, has rocketed the aspiring scientist to local and national fame. Goodell said his mission for the project was to exonerate quarterback Tom Brady, whom he hails as a hero. As a longtime Patriots fan, Goodell wanted to put to rest any inkling of doubt about the team’s performance. According to the Wells Report on Deflategate released last May, 11 of the Patriots’ footballs during the 2015 AFC Championship game against the Indianapolis Colts measured under the league-mandated 12.5 PSI. Just one was two pounds under. Brady was accused of being “generally aware” of an alleged scheme to deflate the balls. But Goodell, the student, came to a different conclusion in just 8 pages. Using a fully inflated, official NFL football, Goodell went to work in November on his project. By the science fair on Feb. 26, he said he found proof that Brady is innocent. Goodell’s project, called “How Weather Conditions Affect PSI of a Football,” was on display at the science fair last month. He said people laughed at his last name, which he begrudgingly shares with the NFL commissioner, but admirers applauded his efforts. School officials said Wednesday that they were proud of Goodell’s achievement, and baffled by the sudden interest in a seventh-grader’s modest science project. Goodell said he hadn’t heard from Brady or the Patriots — or Roger Goodell. But he had a stern message for the commissioner: “I’d like to tell him to give Brady a break,” he said.